Last year, producer Adi Shankar (Dredd) and director Phil Joanou wowed Comic-Con 2012 audiences with the 10-minute short film Dirty Laundry, which saw Thomas Jane reprise his role as one of Marvel's most famous antiheroes, The Punisher. This year, Shankar returned to San Diego with a new short film featuring the Marvel character Venom called Truth in Journalism. The movie, directed by Joe Lynch (Knights of Badassdom) and featuring True Blood's Ryan Kwanten as Eddie Brock/Venom, is a darkly comic combination of 1980s era Spider-Man comics and the cult Belgian mockumentary Man Bites Dog (which follows a horrifying day in the life of a psychopathic serial killer). SR: I know that you're a comic book fan from way back. What was your intention in making this your next short film? AS: The concept behind 'Truth in Journalism' is one I've had for a while. It was actually an idea I had for either a 'Dredd' sequel or a 'Duke Nukem' movie. The idea was to take 'Man Bites Dog,' that super-niche movie, and mash it up with a well-known antihero. Essentially then, you're making a dark comedy. It's a concept where you're taking a character that's inherently over the top, then you drop him or her into an overly realistic, grounded reality. So you have everyone around this person scratching their heads going, "Dude, why is this guy behaving like a cartoon character?" 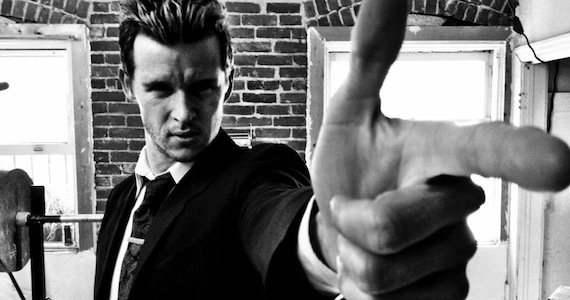 Ryan Kwanten is a such a fantastic actor because its nearly impossible to make something like that believable. 10 times out of 10 Ryan brings a sincerity and emotional kineticism to every performance that elevates the material ... He's the Daniel Bryan of Hollywood. SR: Obviously, this is something that's just for fun, but is there anyway to tie this up into what the big studios are doing - like Sony with Spider-Man or Marvel with The Avengers? Can you use these shorts as a launching pad to propose adding some of these characters into those franchises, or is just out of the question? It's out of the question for a bunch of reasons. When you're removing these characters from all the commercial stuff, from having to engineer into the Robert Downey Jr. version of The Avengers universe, then you're inherently restricting the characters. The Spider-Man universe is PG-13. The Avengers universe is Pg-13. These are essentially Pixar movies at this point. Venom, The Punisher, Deadpool...these characters kind of exist in their own world. At the end of the day, I do these for fun and creative fulfillment. It's a chance to work with people that I really like and really believe in. SR: You seem to have a really good read on how video and film is being distributed - whether Video on Demand, Netflix or whatever. Both Dirty Laundry and Truth in Journalism are being released directly to the Web.What's your approach to video distribution now? If you go back to 2001 and you wanted to watch entertainment you had the movies in theaters, the movies in discount theaters, the movies at Blockbuster, your personal DVD collection, and what was on TV. And that was it. Today, with the click of a button, you basically have everything that was ever made available to you, within reason. In five years, you are literally going to have everything that was ever made available to you with the click of a button. As a result, people are no longer incentivized to say, "Hey it's Saturday, let me get out of my house, go to a movie theater, pay $20, get popcorn and watch a movie," especially if the movie feels like another version of something they could see on Netflix. That is a paradigm shift that just happened and people weren't really anticipating it, but, especially for younger people, it's a big thing. We'll have Truth in Journalism here at Screen Rant on Wednesday. In the meantime, what do you think about characters like The Punisher and Venom? Is there a way to bring them into their respective mainstream movie universes while still being true to the characters, or do they exist in their own world as Shankar says?